3 Beds, 2 Baths, 1793 SQ FT.
NO HOA! You will be wowed by the pride of ownership in this 3 bed 2 bath horse property. From the low maintenance frontyard to the extended back patio there is so much to love. Sitting on nearly 1/2 acre it boasts upgraded counters in the kitchen & bathrooms, newer flooring & two walkin closets. New windows along the front of the home, duo pane windows along the back, ceiling fans throughout & a Carrier AC unit less then 6 yrs old make the home very energy efficient. The homes wiring was redone in 2018 & a water softener was added in 2017.Talk about the ultimate mancave (or sheshed) the huge shop with 220 electric & built in work benches is AMAZING. There is plenty of parking with the attached 2 car garage on top of the circular paved driveway out front & side RV gate w/220 hookup. Why should real estate agents hire professional photographers? Photography matters when selling your home. With online listings from real estate agents and websites like Zillow, Trulia, and Realtor.com, buyers are now getting what’s essentially a “first showing” through the web. This means a seller needs good listing photos to create a positive impression of their house. This photo is from a real estate agent that thinks this photo will help sell the house. This photo is from a professional and you can see how the location has a great view from the windows and this will help sell the location fast and for more money. You can see the difference between the professional and the non-professional photography and how using a professional can help you sell the location 50% faster with a increase sale price. Time and time again you can do the research and see the same results that home buyers want to see beautiful photos. Home buyers spend 70% of their time viewing photos online, while only 30% on the property descriptions and 85% of buyers deem photos to be important listing information. Do you want to miss the first showing of a house? do you want more phone calls about your listings? The only way to do this is to step up your game and start to work with Professional Photography today! Real Estate Agents Stop Breaking the Law! Which Real Estate Listing Photography Package Is Right For You? ''STEAL OF A DEAL'' Why pay $125,000 for a home that's not remolded when you can own this phenomenal home situated on a corner lot and is fully renovated for the SAME PRICE!!!! The only thing this house is missing is a new homeowner to call this house a home. Featuring new: Tile, Carpet, 2 tone paint and more...(I'm not going to give all the goodies away-MUST VIEW TO SEE THE REST)This home is priced to move, don't delay/buy it today! 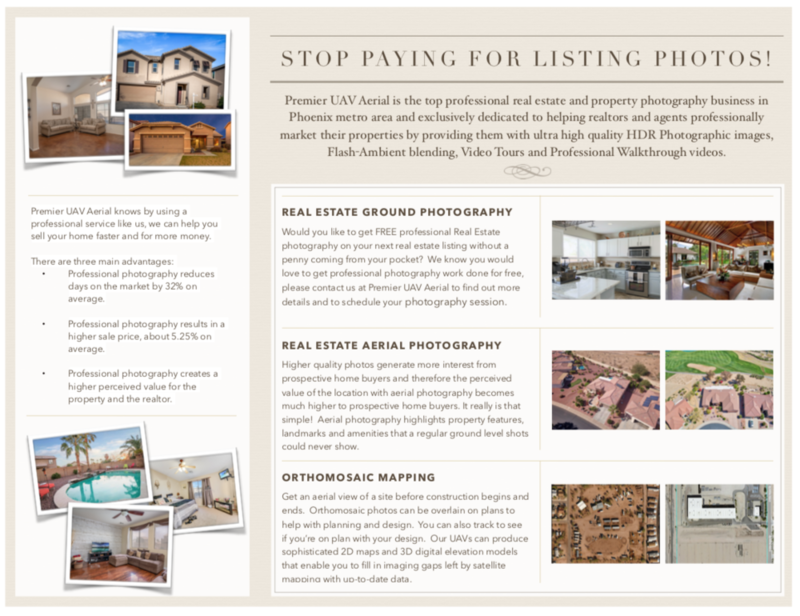 STOP PAYING FOR LISTING PHOTOS... Premier UAV Aerial created an association for a very limited number of Real Estate agents and brokers. Premier UAV Aerial created an association for a very limited number of Real Estate agents and brokers. Real Estate Agents and Brokers Stop Paying for Listing Photos! Would you like to get FREE professional Real Estate photography on your next real estate listing without a penny coming from your pocket? We know you would love to get professional photography work done for free, and this is how you can do that! Premier UAV Aerial has a new program for Arizona Real Estate agents and brokers. Premier UAV Aerial will come to your next listing and take inside Real Estate photographers without a penny coming out of your pocket. We know you are thinking HOW is this true? Professional photography reduces days on the market by 32% on average. Professional photography results in a higher sale price, about 5.25% on average. Professional photography creates a higher perceived value for the property and the realtor. Premier scheduling of photography; this means that your service calls come before anyone else. We put you to the top of the list and give you premier service. Premier Pricing; We put you on the premier pricing list which means you get discounted on all services. Premier listing Insurance; This is the big one. We come to your listings and preform professional photography work without a penny coming from your pocket, so if the listing does not sell, you are not out any money for photography....this is a win win; but if the listing does sell you will pay the invoice for the service out the proceeds of the commission check on the sale so it’s not really come from your pocket at all. To see exactly how our services can benefit you, we would like to become your partner. No other professional photography firm in Arizona is doing this. You pay $99 per year to become a Premier Member of the association. You will get up to 12 listings per year for free. We do not ask for a penny to come out of your pocket, and we do all the work.